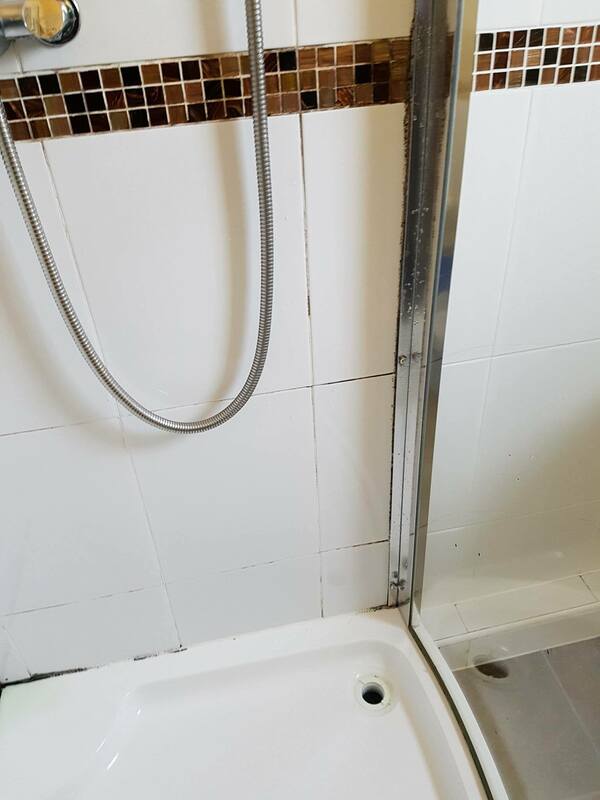 The photographs below are from the bathroom of a house in the Moston area of Manchester which is primarily residential and only 3 miles away from the city centre. 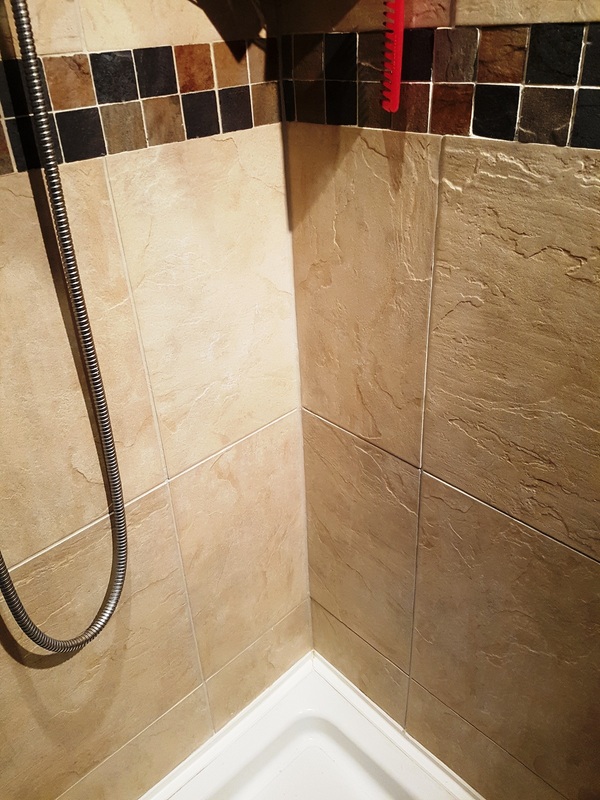 My customer had been primarily concerned with the removal of unsightly mould but was also keen to have the grout in the ceramic tiled shower cubicle given a good deep clean. 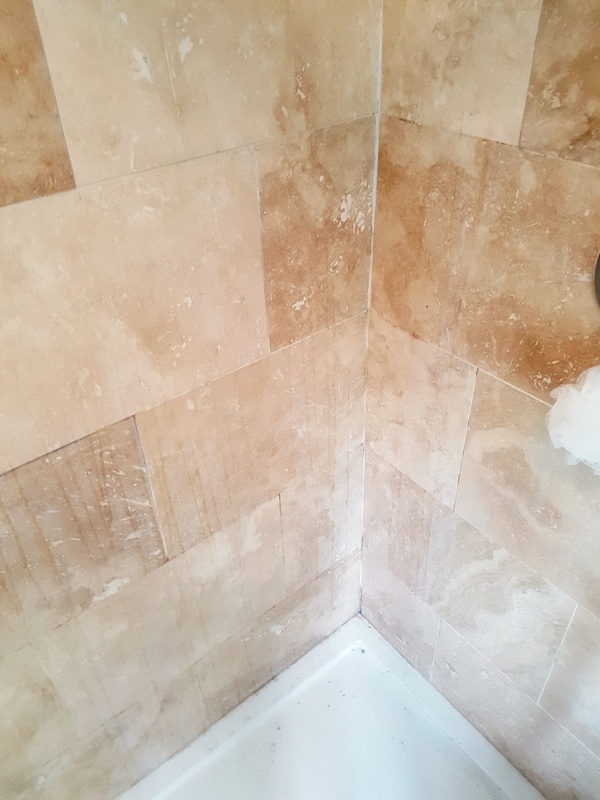 To clean the Shower Cubicle, I used a strong dilution of Tile Doctor Pro Clean which is a strong alkaline cleaner that works really well on grout. 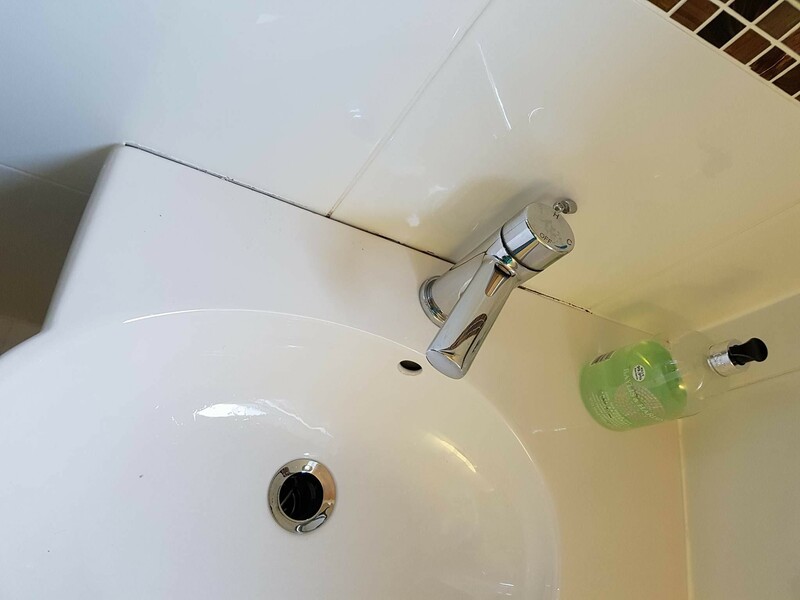 The Pro-Clean solution was decanted into a spray bottle and then sprayed onto the grout lines and left it to dwell. The air in the solution makes it lighter and easier for it to stick to vertical surfaces. After a few minutes the Pro-Clean was scrubbed in using a stiff grout brush. 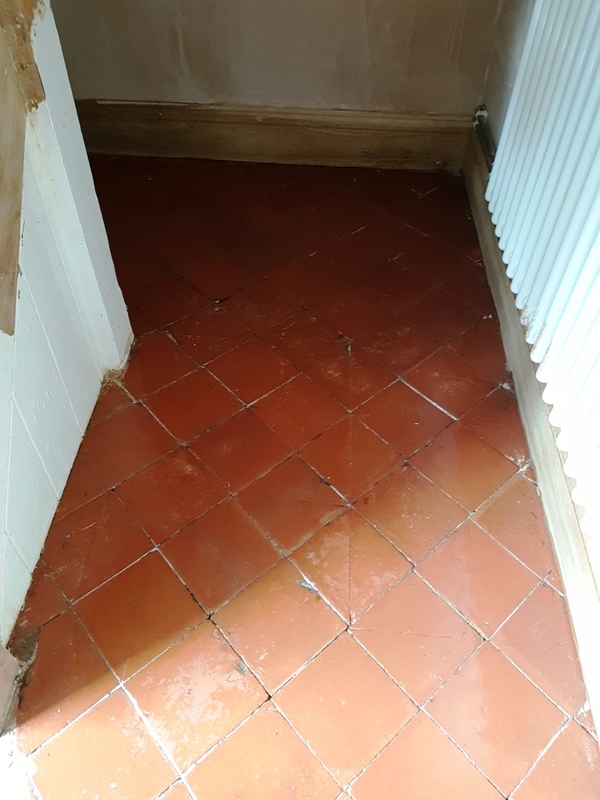 The tiles were then rinsed with water to remove the soiled solution from the tiles and the process repeated where required. Although cleaning process was a success there were still a few mould marks left so to tackle these I used Tile Doctor Mould Away spray using the same process of scrubbing and rinsing. The Mould Away spray did the trick for me and I moved on to remove the silicone around the shower cubicle. When removing silicone, you must make sure you get all mouldy silicone out otherwise it can spread from the old to the new. After I had finished removing the silicone I tidied the shower cubicle and used a bit of gentle heat from my heat gun to dry the grout lines and edges where silicone used to be. 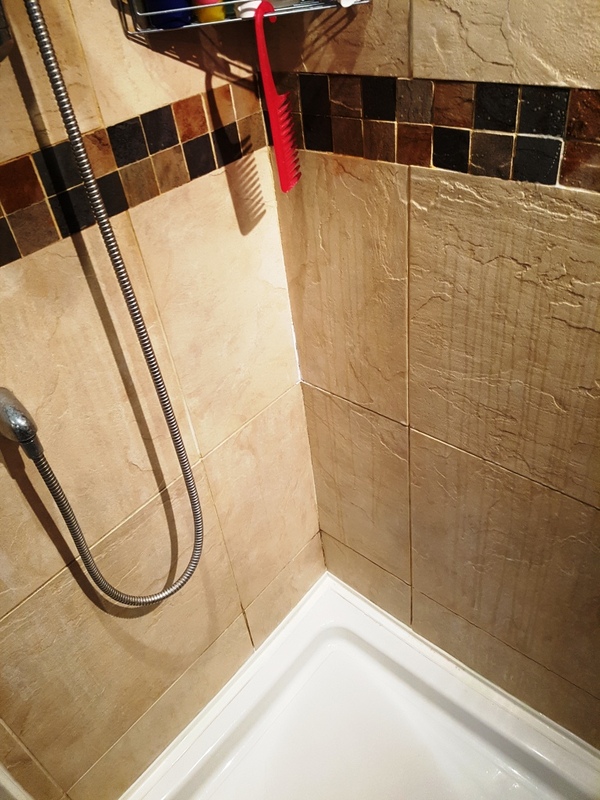 I used my damp tester to make ensure there was no dampness anywhere around the working area and then moved on to colouring the grout which would give the whole shower a fresh and consistent appearance. 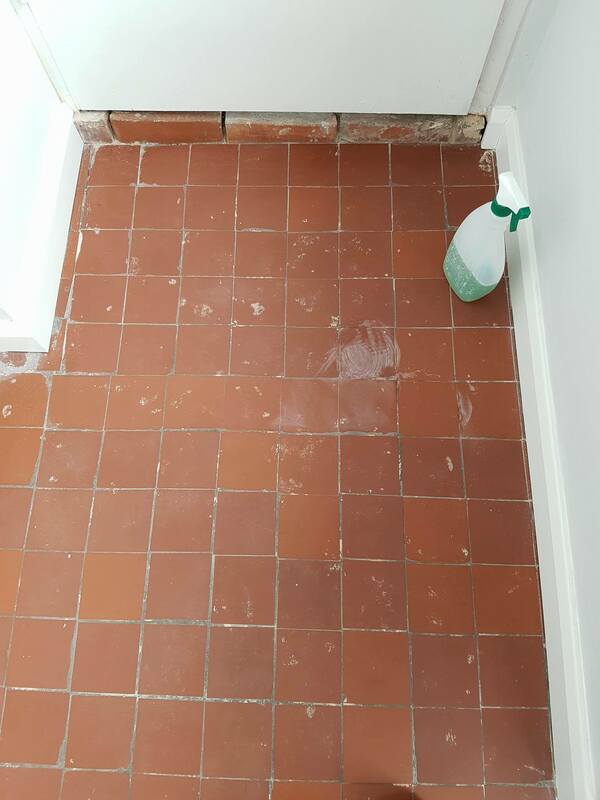 On this occasion, I used a White colour from the Tile Doctor range of Grout Colourant’s, it’s an epoxy based colourant that protects and rejuvenate the grout lines. I had to use 2 coats of colourant to get the best result and then moved on to putting new silicone around the shower base with a high-quality mould resistant silicone. When finished adding fresh silicone I tidied up again and the job was complete. 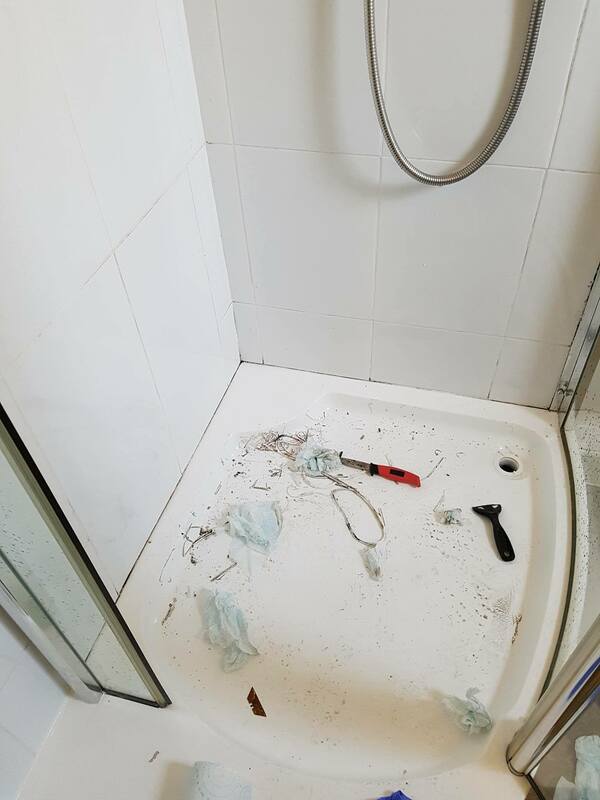 I think you can’t argue the shower cubicle was transformed and customer even said it looks better then when it was new; we also fixed few chips for her whilst there and stripped and replaced the silicone around the sink as a bonus. 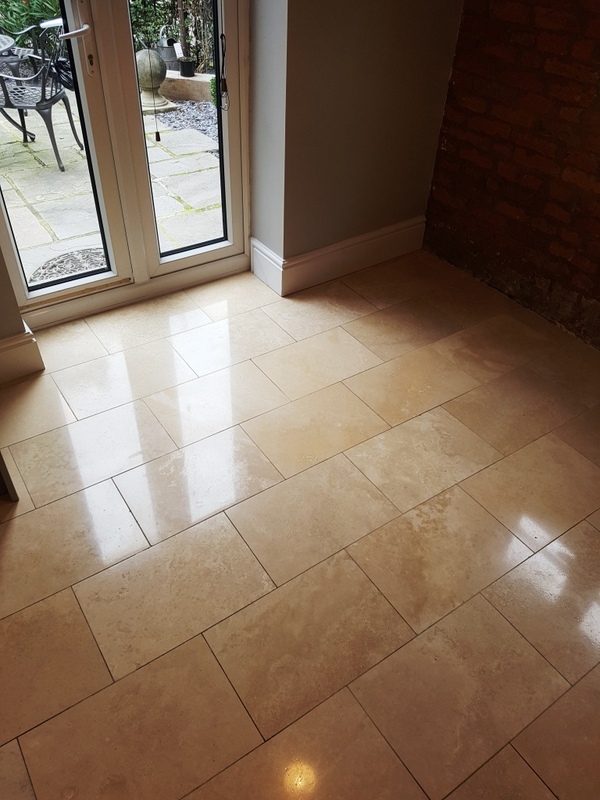 This is a follow-up post from last week where I detailed the restoration of a beautiful polished travertine floor that had been installed on most of the ground floor and bathroom at a property in Newton Heath. 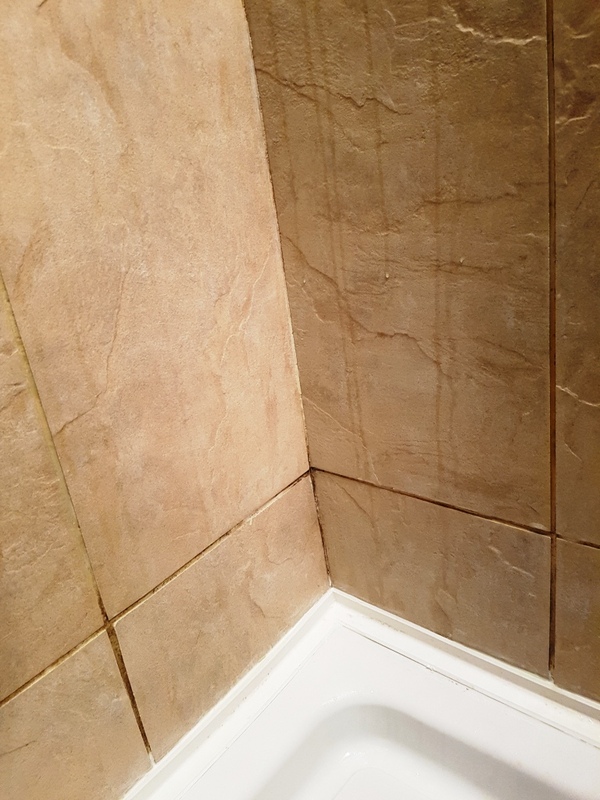 After cleaning, polishing and sealing the floor tiles the owners asked if I could apply the same treatment to their Travertine tiled shower cubicle which was not looking its best and had become stained over time. 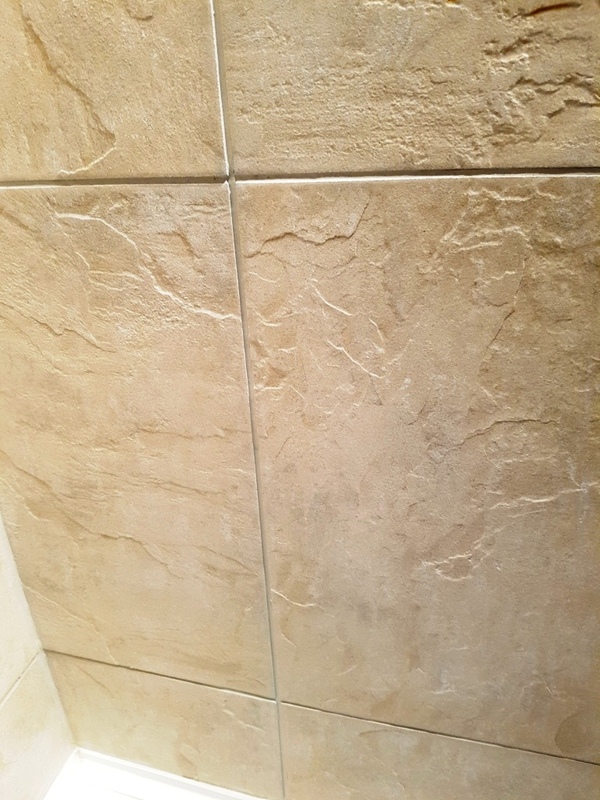 First I successfully cleaned the grout with a medium dilution of Tile Doctor Pro-Clean scrubbed into the wall grout with a special stiff grout brush, the tiles were then rinsed with water and the process repeated until I was satisfied with the result. 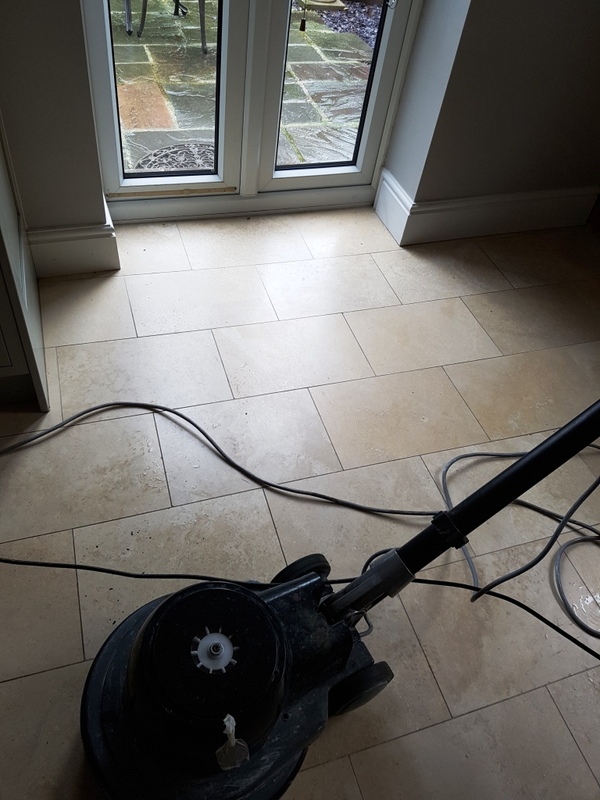 To clean the Travertine wall tiles I used the same Diamond pad system as I did on floor, starting from 400 grit and moving up to 3000 grit pads lubricated with a little water, the only difference this time was that I used smaller six inch pads fitter to a hand held burnishing machine. 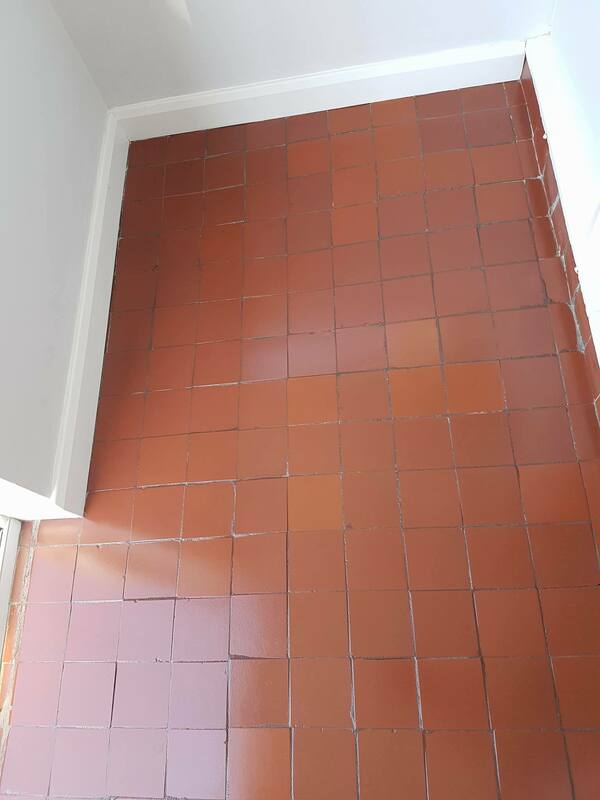 After I completed all the cleaning and the tiles had dried I proceeded to seal them with Tile Doctor Colour Grow sealer, this is the same sealer that I used on the floor and the excess was polished off with cotton cloths. The last remaining step was to strip out the silicone sealant strip from around the base of the shower cubicle and replace with new. I used high quality anti mould silicone sealant that left nice lines and fresh look. 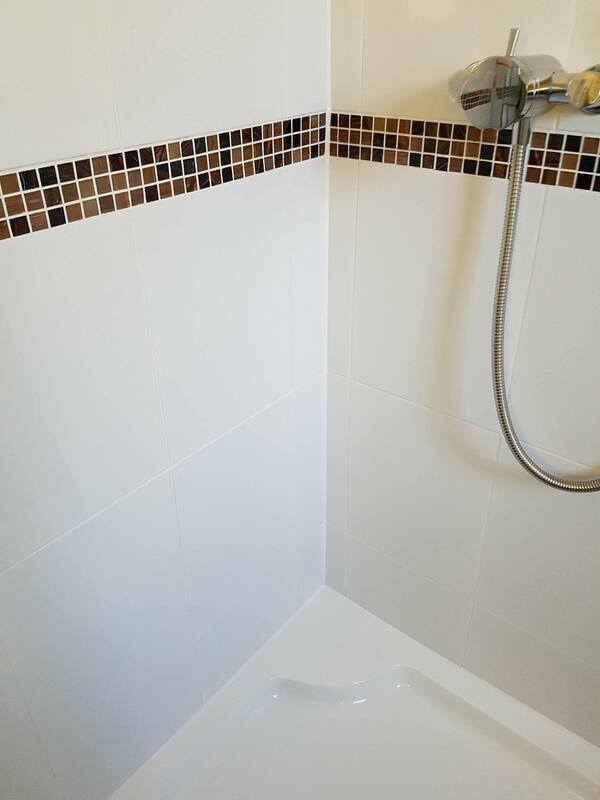 Needless to say, that customer was very happy with the work carried out on the floor and shower cubicle and recommended me to his neighbour straight away. 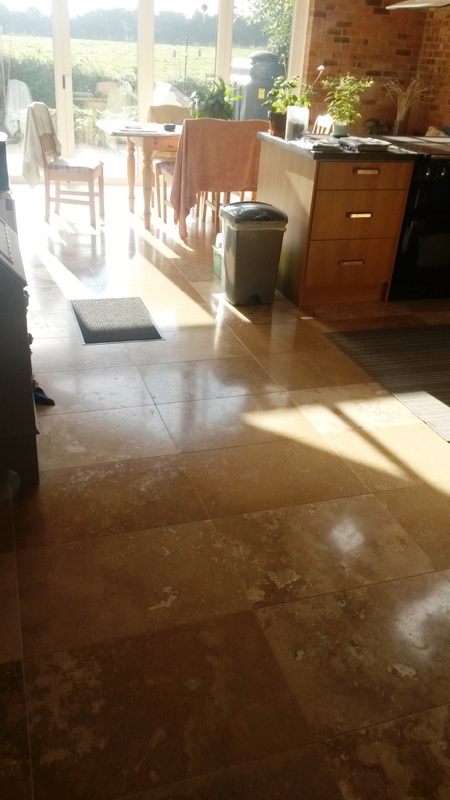 This customer in Newton Heath, just outside of Manchester, used to have a beautiful polished travertine floor on most of the ground floor and bathroom but over time it was getting duller and duller as the polish became worn down, not helped I might add by their choice of cleaning products which were not appropriate for this type of floor. Additionally, numerous cracks and holes had appeared in their floor and worried it was going to get worse they decided to call in some professional help and get the whole floor fully restored. When I got the call I went over to the house to take a in-depth look at the problem and recommended that the floor was burnished using diamond pads of different grades. 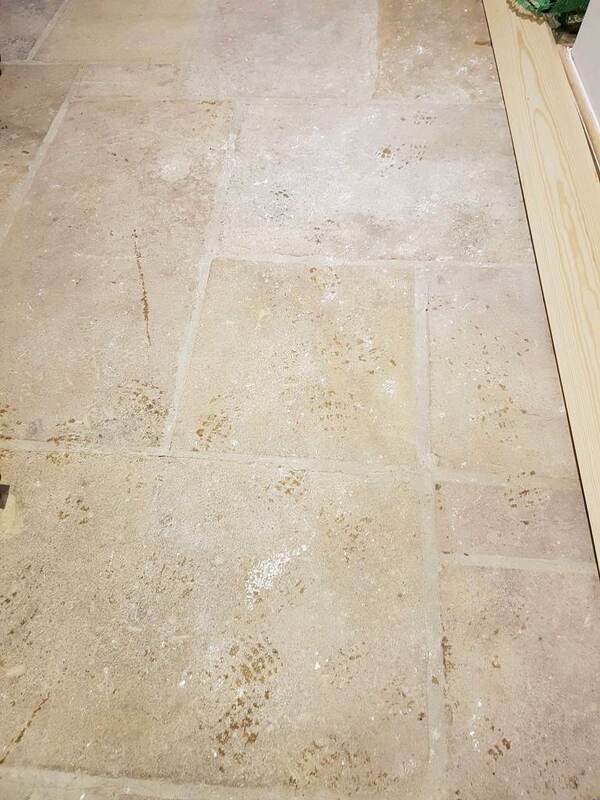 They also asked if I could apply the same treatment to the travertine bathroom floor and shower cubicle as well, which I was very happy to do so we agreed a price and scheduled a date to do the work. 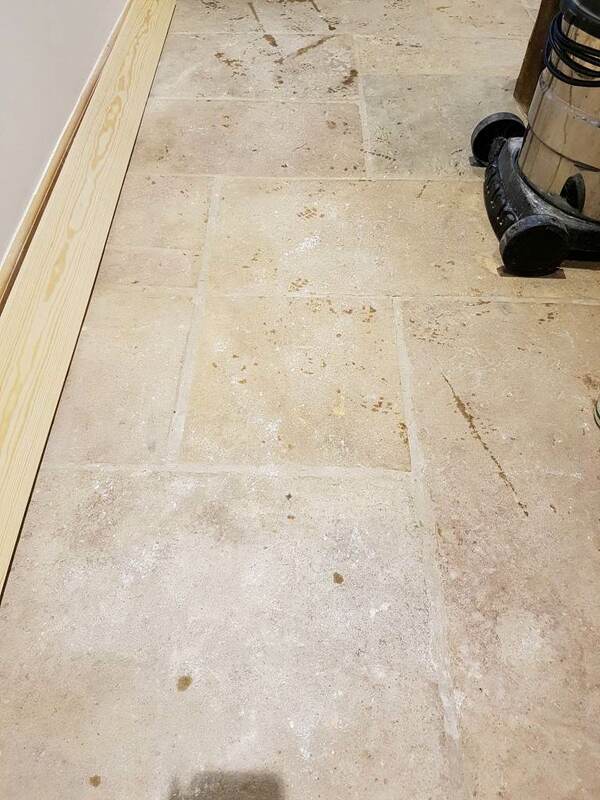 To start the burnishing process, I applied the Coarse 400 grit burnishing pad to the floor using rotary machine and water as lubrication to break down and remove any old sealer from the stone. When finished with first burnishing pad I removed all the soiled water left on floor with a wet vacuum. 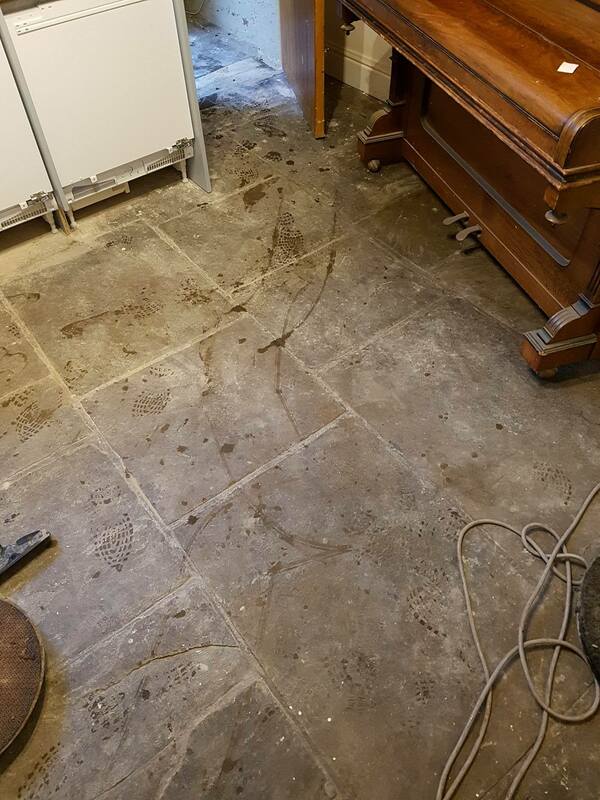 This removal process of soiled residue was repeated after each use of a burnishing pad. Next, I moved on to the Medium 800 grit pad which is less coarse, but still rough enough to break down layers of ingrained dirt. I followed this up with the application of a Fine 1500 grit pad, which started to smooth down the rough areas of the surface to prepare the floor for a final polish with 3000 grit. However before moving straight on to the final of the four pads, I took the time to carefully fill in the all the small cracks and holes in the stone, before leaving the floor to dry until the next day. The next morning, I returned to the property to finish off the floor restoration. As soon as I arrived I used a damp tester to make sure the floor was completely dry. All was well so I went over the floor with the final Very Fine 3000 grit burnishing pad, this time without any water lubricant, to finally achieve a high quality polished finish. 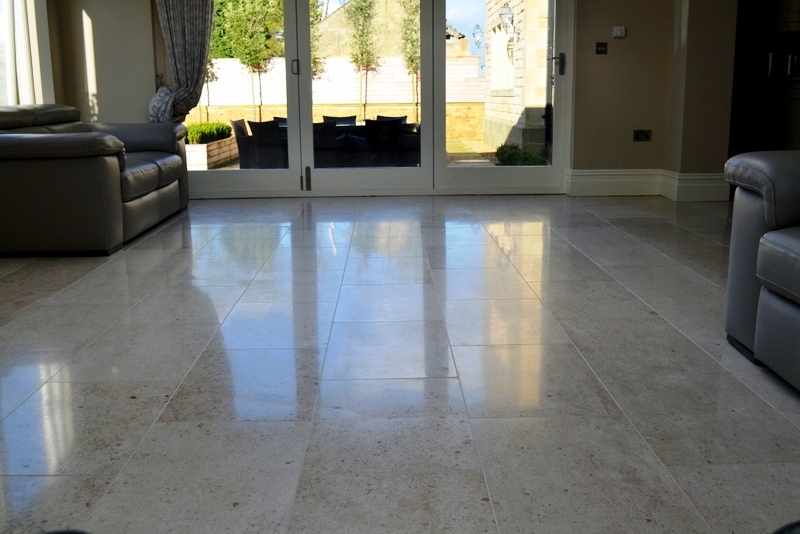 For polished floors, we recommend the use an impregnating sealer that penetrates the pores of the stone rather than sitting on the surface of the floor, as this ensures the quality of the polish isn’t damaged. With this in mind I applied Tile Doctor Colour Grow to seal the tiles. This is a colour enhancing sealer that provides durable surface protection and allows the surface to breathe whilst enhancing the natural colours in the stone. At this point it’s important that any sealer that doesn’t penetrate the stone is removed by polishing it off with a cloth. 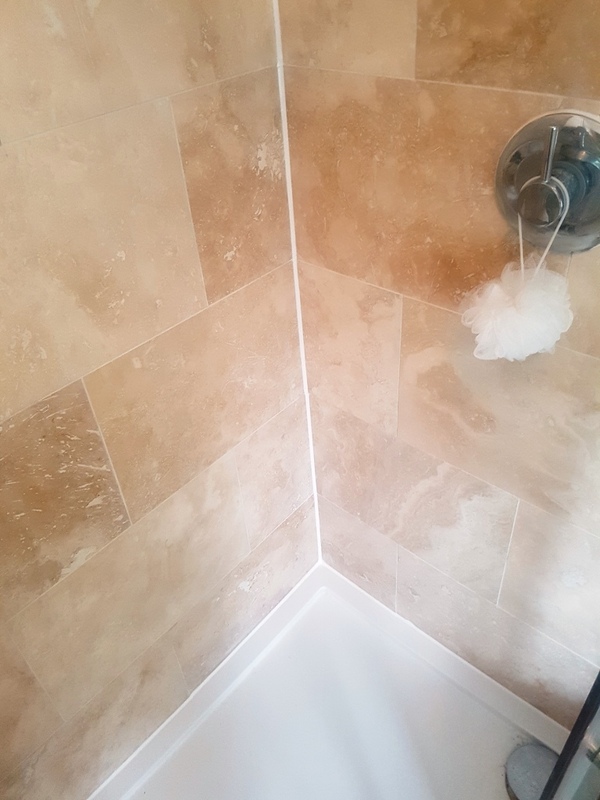 After this I went on to repeat the cleaning, polishing and sealing process on their Travertine Tiled shower cubicle but I’ll detail that in a separate post. 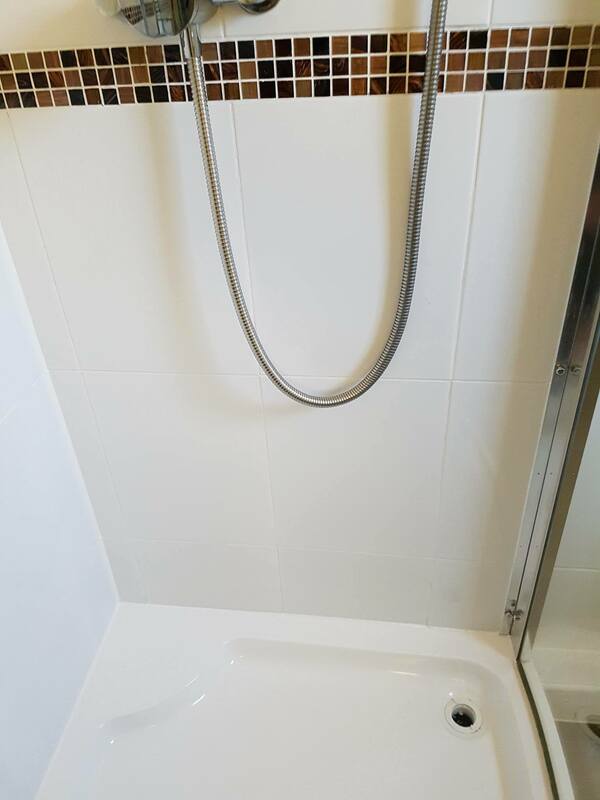 Needless to say, the customer was very happy with the work carried out on the floor and shower cubicle and recommended me to his neighbour straight away. 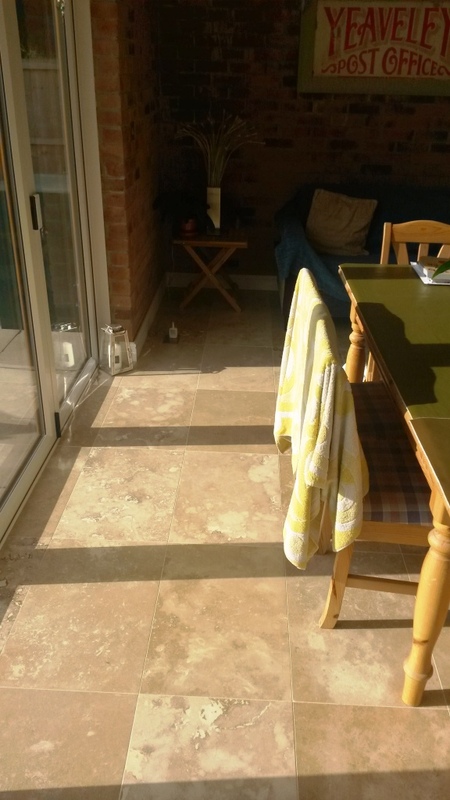 This customers, who live in the town of Hyde, Greater Manchester, were in the process of replacing their kitchen furniture when they realised just how soiled their fantastic Yorkstone tiled floor had become after years without attention. 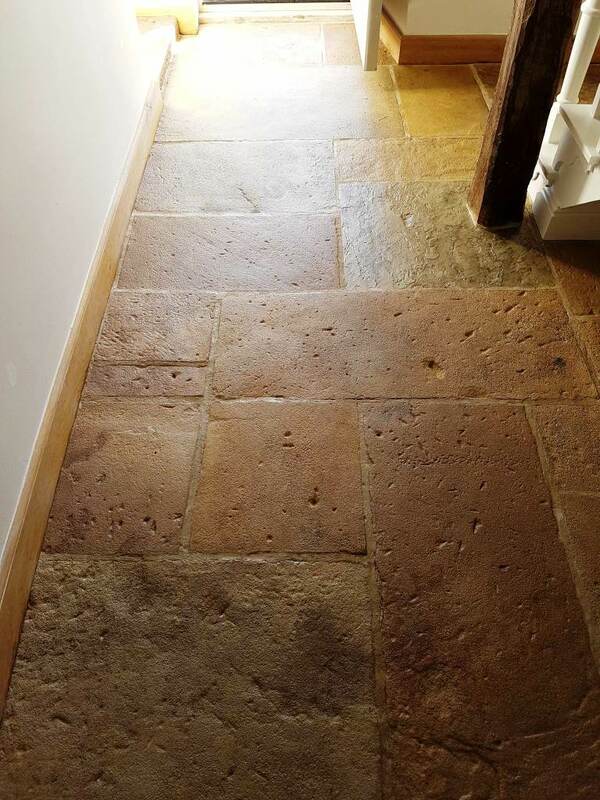 If you’re not already familiar with Yorkstone, you may be interested to know it is a variety of Sandstone that is manufactured unsurprisingly in Yorkshire quarries since medieval times. It’s known for its hard wearing and durable qualities, but no stone can be completely immune to dirt and staining built up over years of use. 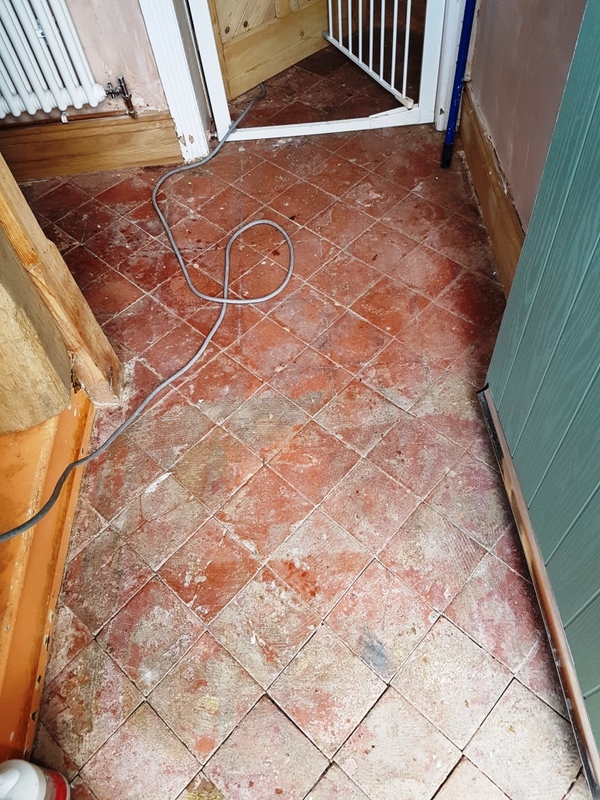 The customers were struggling for success with their own cleaning methods and supermarket products so they decided instead to see what a Tile Doctor could do to restore the floor. I was happy to oblige and on my first visit demonstrated what was possible by doing a test clean which the customers were very impressed with and booked me in straight away. 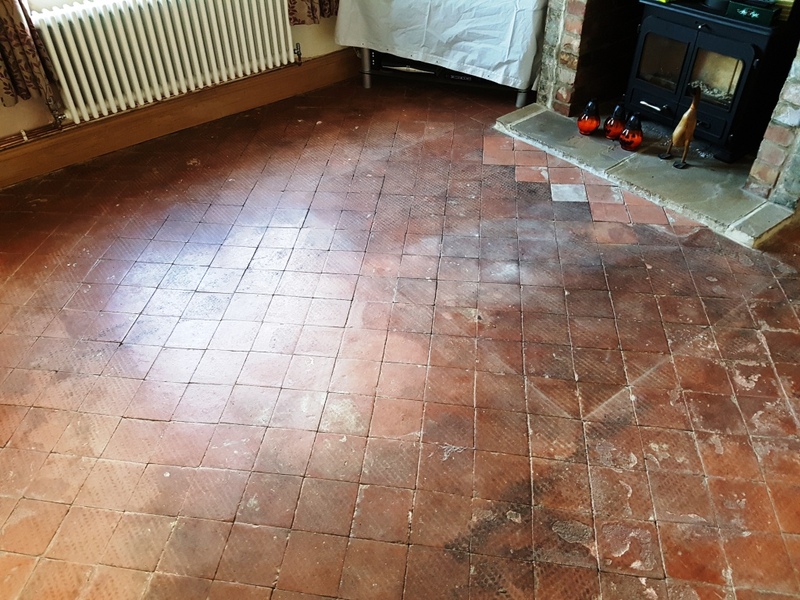 As a result of the test clean I knew I could get good results cleaning the floor using Tile Doctor Pro-Clean which is a heavy duty alkaline yet flexible cleaning product that can also can strip sealers from tiles when used in a strong dilution. In this case a strong dilution was exactly what I needed and it was applied liberally across the floor, and left it to dwell and soak into the stone for about ten minutes. I followed this by scrubbing it into the stone with black scrubbing pad fitted to rotary machine, successfully eradicating the thick layers of muck and any remaining sealers in the process. After scrubbing the entire floor, I extracted all the now soiled cleaning solution using a wet vacuum and then spot treated any areas that looked like they needed more work. On the whole, the cleaning process was a success, however, in one corner I discovered a thick tar stain that had been there for years. As the tar was solid as a rock I decided to apply an even stronger product to shift it. 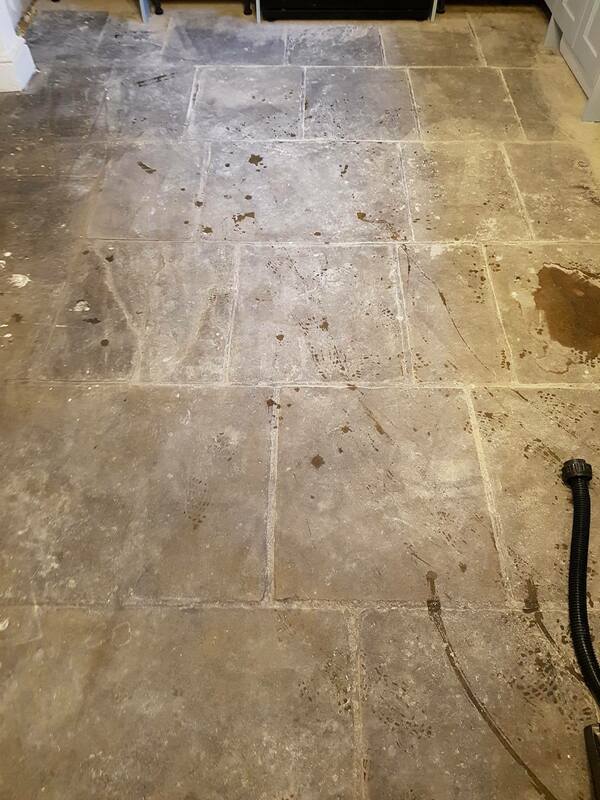 Fortunately, I have a number of products that I can use and in this case I was able to deal with it by applying Tile Doctor Nano Tech HBU, which is our heavy soil build-up remover. After application, it was left it to dwell for half an hour and then with the aid of a steamer and black scrubbing pad to soften the build-up even more I managed to remote it entirely. 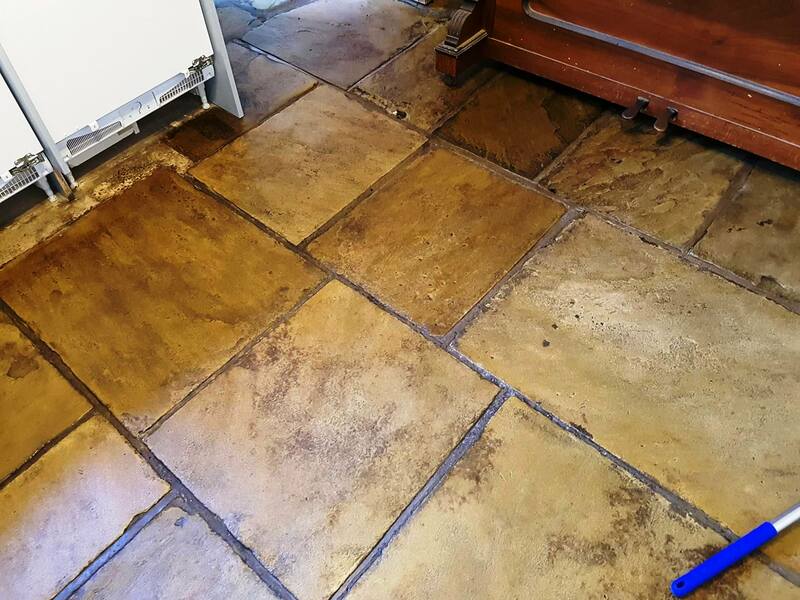 Once I was happy with the condition of the flagstones and grout I gave the floor a thorough rinse with water, this was to ensure any trace of cleaning product was removed before sealing again the wet vacuum was used to remove the water from the floor and get the stone as dry as possible. The floor was then left to dry for 48 hours after cleaning. When I returned the the property two days later I promptly ran some damp tests all over floor and discovered a few minor issues. I solved these with heat gun and the floor was then ready for sealing. 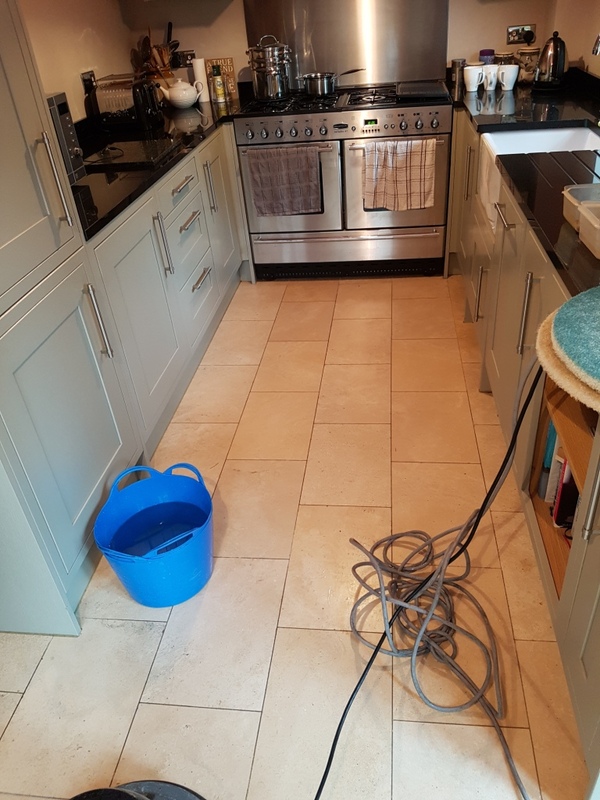 To seal the Yorkstone tiles, I used Tile Doctor Seal & Go, which is topical water-based blend of acrylic polymers designed to provide durable surface protection and a low sheen finish. As a topical sealer (which sits as a protective barrier on the surface of the tiles) Seal & Go makes cleaning the floor much easier. I used four coats of the sealer, allowing for a 30 minute drying period between coats. As you can see from the photograph the result was truly fantastic! 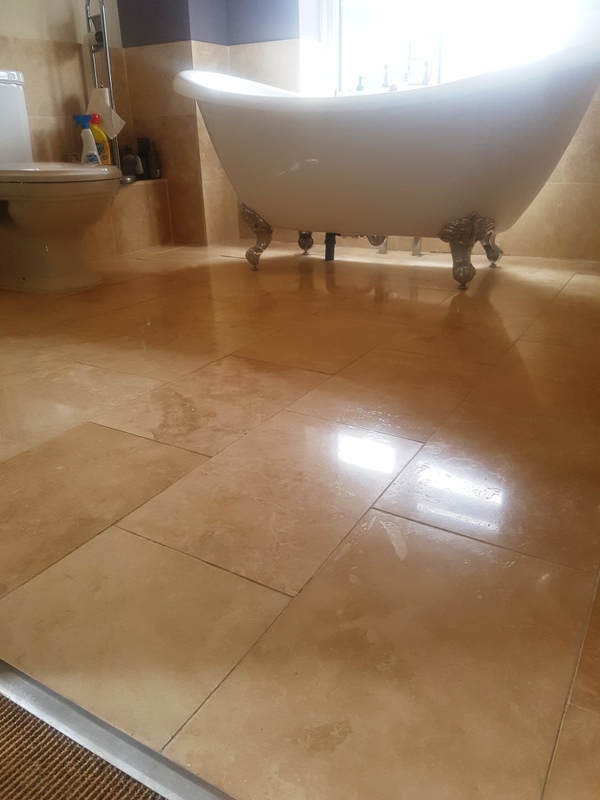 The customers were extremely pleased with the result and told me that they never knew there was such a lovely floor hiding underneath the muck. They also said that I saved them a lot of money and preserved the character of house because they now no longer feel compelled to replace the floor! This property in Hattersley had just undergone major building works which had lasted for couple of years. 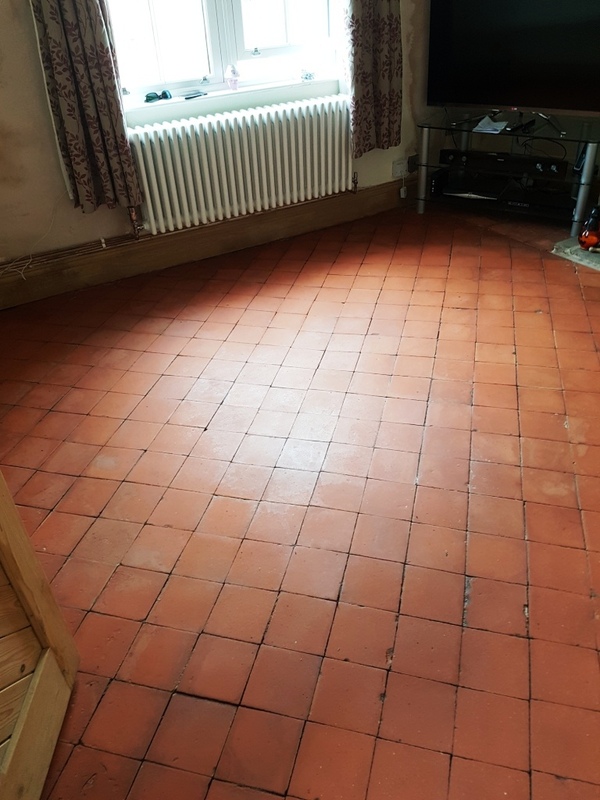 During that time the Sandstone tiled living room floor had suffered greatly during the building works. 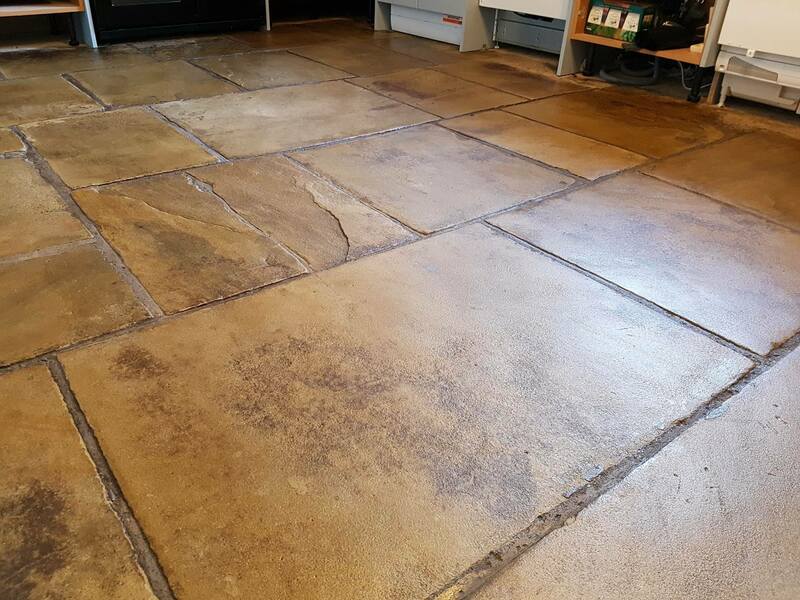 Additionally, the sealer previously used on the floor was a clear impregnating product which did nothing to bring out any natural colours in the Sandstone, leaving them dull and lifeless. 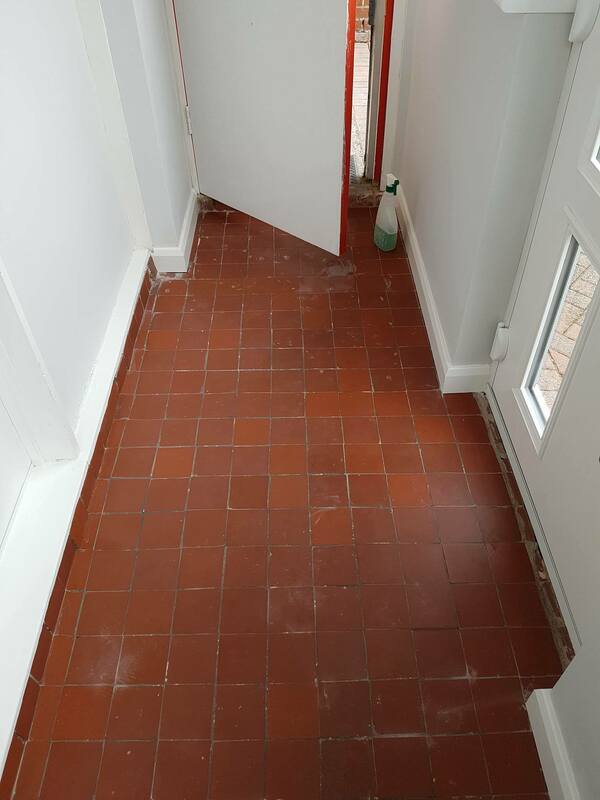 The situation had been made worse but the building work mess, and the property owners were keen to get their local Tile Doctor in to resolve the problems. 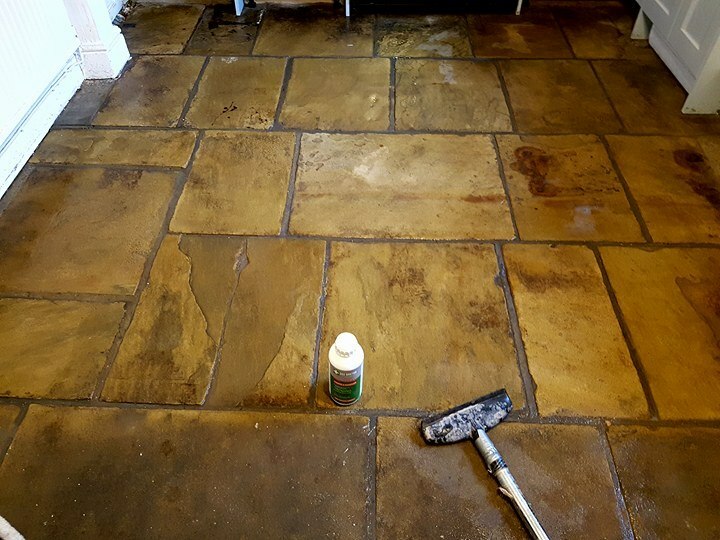 For the cleaning process, I used a strong dilution of Tile Doctor Pro Clean, which is our strong alkaline flexible cleaner meant for heavy duty cleaning and when used in more concentrated form for the stripping away of old sealers. I applied a strong dilution of Pro Clean across the floor and left it to dwell for about ten to fifteen minutes so it could work its magic on the layers of dirt and old sealer. I followed this by getting on my knees and scrubbing the product into the stone with a stiff scrubbing brush. 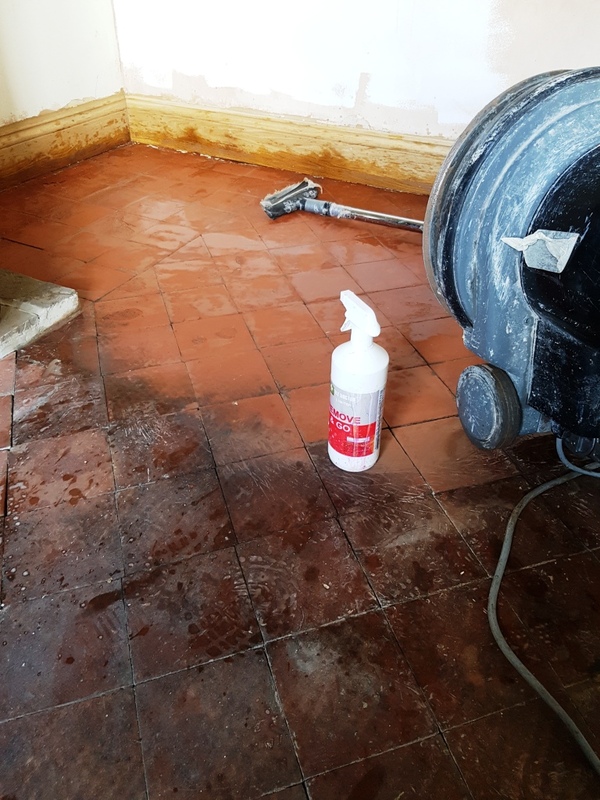 In this particular scenario, there wasn’t much that could be done with a rotary machine as the floor was very rough in texture and with a scrubbing brush it was much easier to reach the ingrained dirt. After scrubbing, I removed all of the dirty cleaning solution with a wet vacuum, before rising the floor several times with clean water to get rid of all chemicals. With the cleaning process a success, it was time to leave the floor to dry for 48 hours before sealing. When I returned two days later to seal the tiles I started by using my damp tester to check for moisture that could affect the performance of sealer. Even the smallest quantity quantity of moisture can cloud the sealer and reduce its effectiveness. Once satisfied that the floor was completely dry, I started sealing. 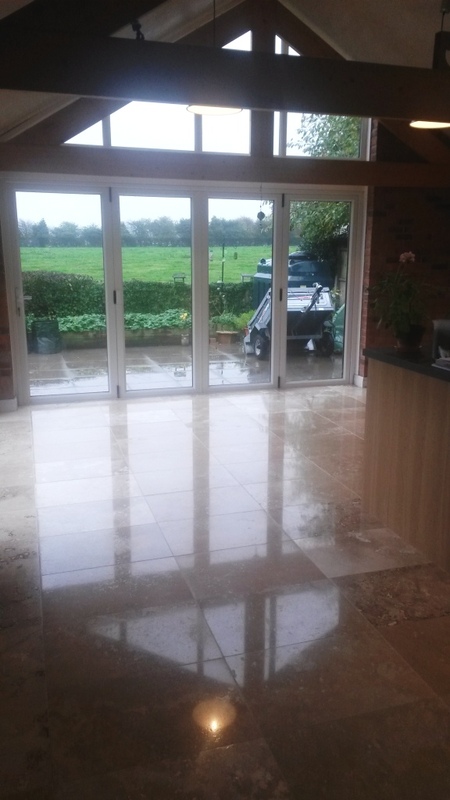 I chose to use a topical Tile Doctor sealer called Seal & Go, which is a water based blend of acrylic polymers that is recommended for this type of stone providing stain resistance whilst enhancing the look of the tiles and providing an aesthetically pleasing low sheen finish. I applied four coats of the sealer and the transformation was complete. I think the result speaks to itself, especially when you look at the before and after photos. After completing the work, I left the very happy customers with a complimentary bottle of Tile Doctor Neutral Tile Cleaner to help them make sure future cleaning and maintenance is done correctly. 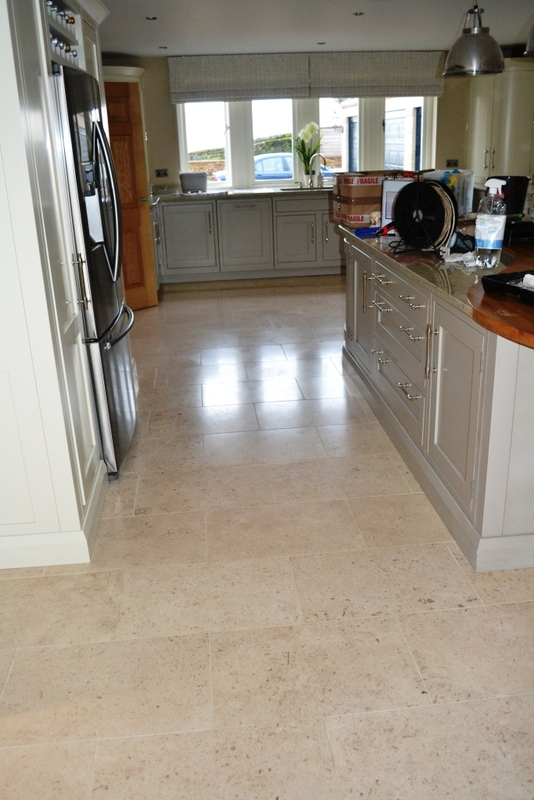 While popular and highly coveted due to its natural brown colouring, Travertine is not as tough as other types of natural stone and thus needs regular maintenance if you wish to keep it looking good. 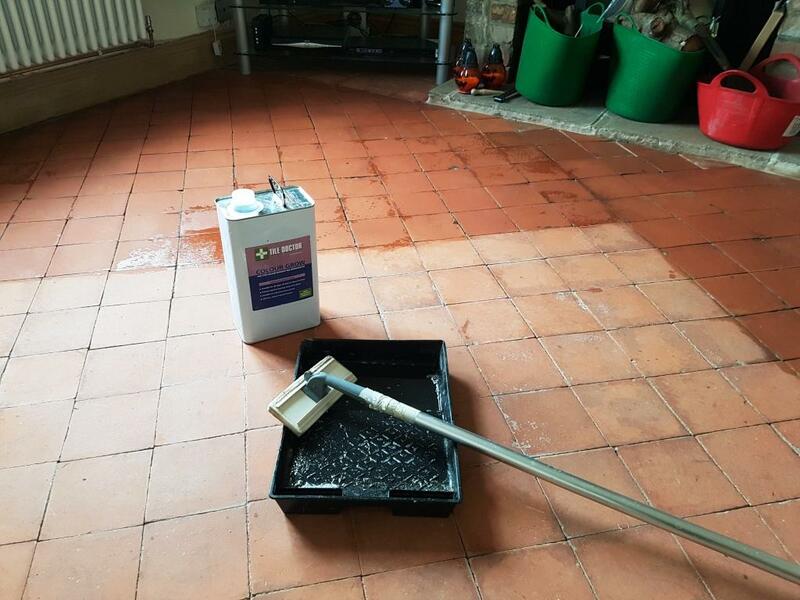 Without it the polish can quickly dull, and can suffer from erosion over time if acidic cleaning products are used often resulting in small holes or pitting appearing. 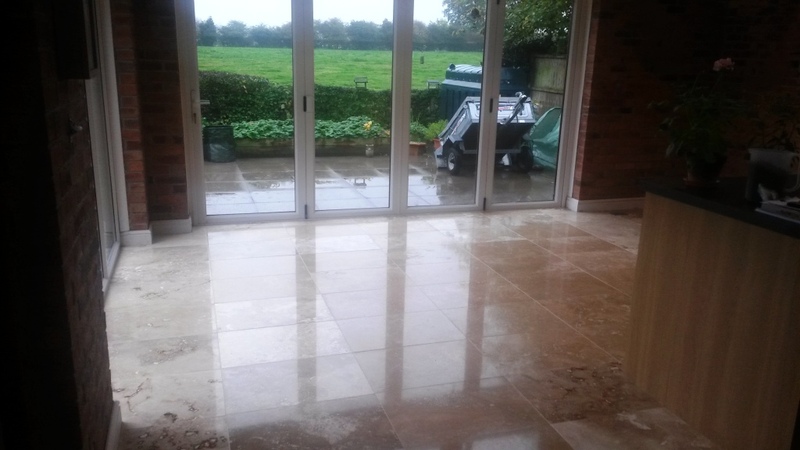 This house in the Manchester suburb of Didsbury had a particularly large area of Travertine tiles which had proven to be very difficult for the property owner to maintain. 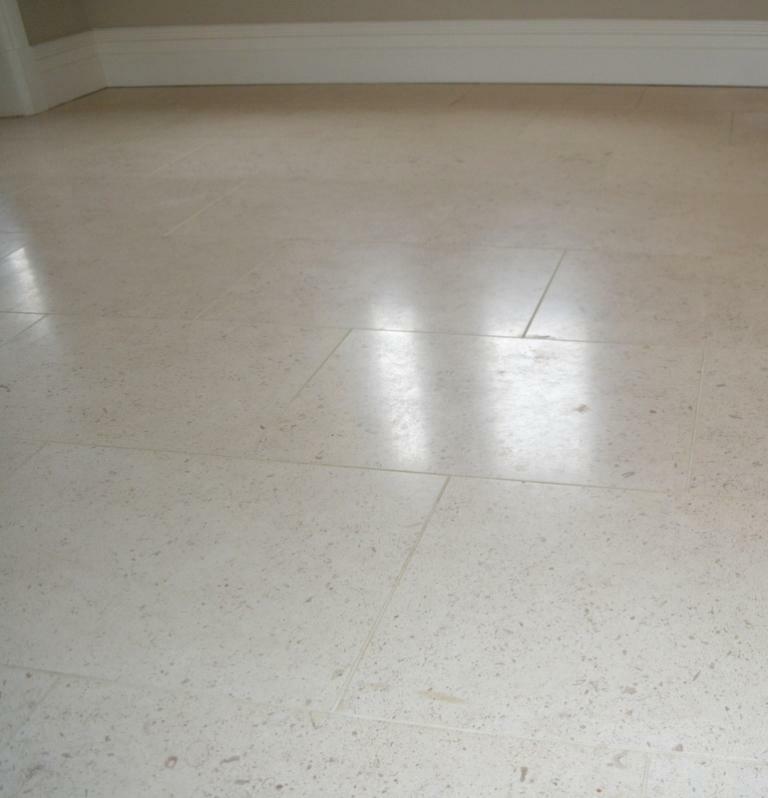 When I spoke to her I explained that Tile Doctor have a reliable process for the restoration of Travertine and similar types of natural stone such as Marble and Limestone using a polishing process we have developed called burnishing, and I assured her that we could achieve the same with her floor. 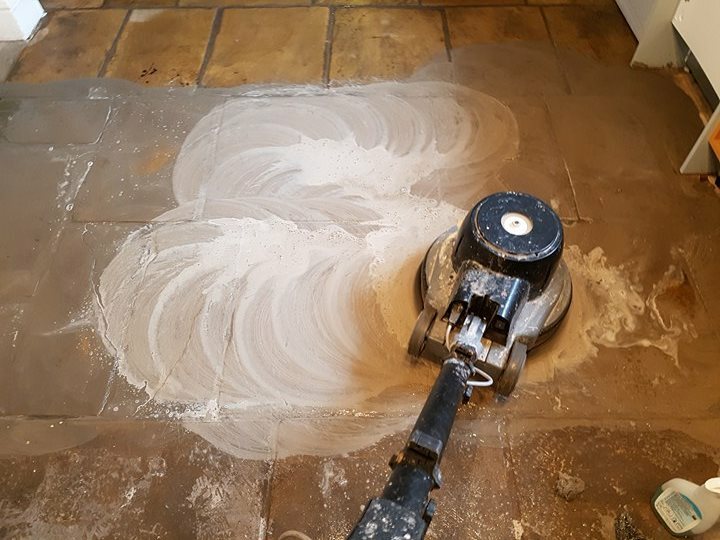 Tile Doctor’s burnishing system involves the application of four different diamond encrusted burnishing pads in sequence from coarse to fine, using a small amount of water with each pad for lubrication. 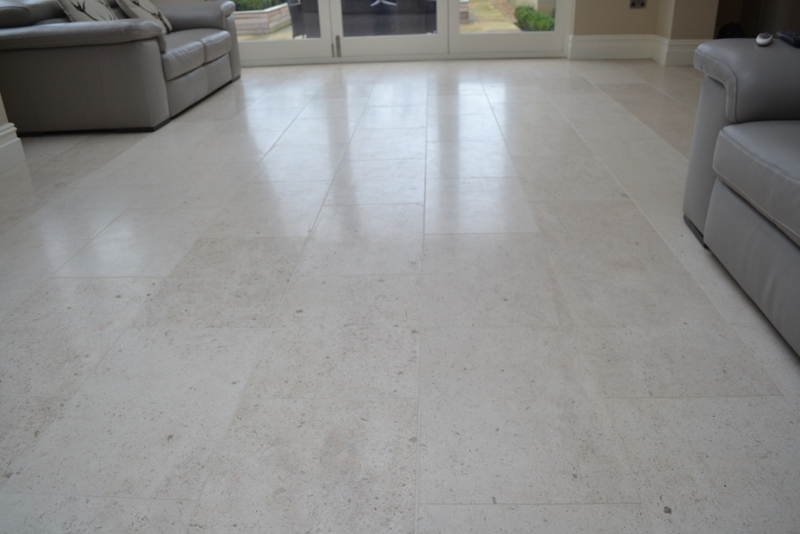 I started work on this Travertine by applying a Coarse 400 grit burnishing pad to strip away dirt and any old sealer remaining on the tiles, before removing any dirty water with a wet vac machine and rinsing the floor (a process which is repeated after the application of each pas). Next, I moved on to the Medium 800 grit pad, which I used to break down any ingrained dirt and stubborn marks, and to start smoothing down the rough and uneven surface that had developed on some of the tiles. I then used the Fine 1500 grit pad to smooth the surface even further and get the floor ready for its final polishing. 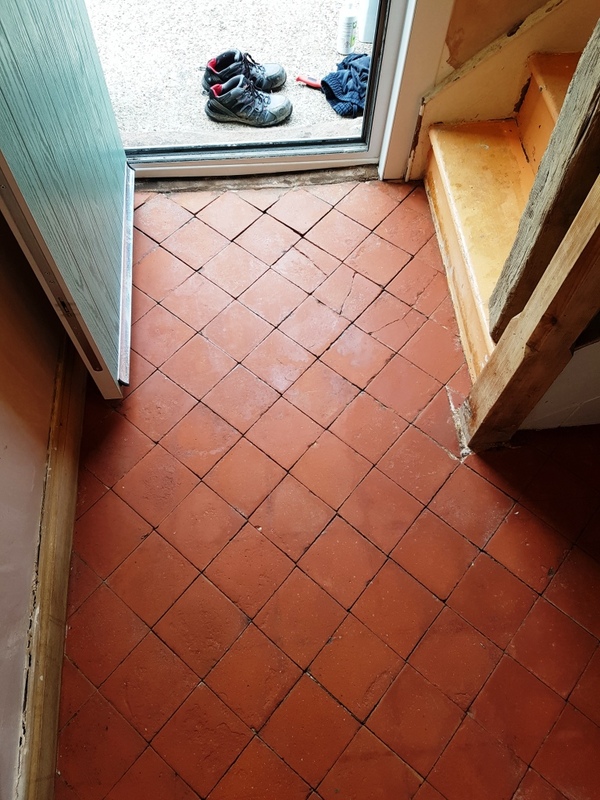 However, before applying the fourth and final pad, I took the time to carefully fill all the cracks and holes as these were spoiling the overall appearance of the tiles. Following this I left the floor for the day so it could dry off fully overnight. I returned to the property the next morning to seal the floor. My first course of action was to run a damp test; which we do in every situation as even a small amount of damp threatens to spoil the sealer. The test did reveal some damp spots, so I used my heat gun to dry them out quickly. Once the floor was completely dry, I went over the floor with the Very Fine 300 grit pad, without any water as lubricant this time, to achieved the final desired polish. 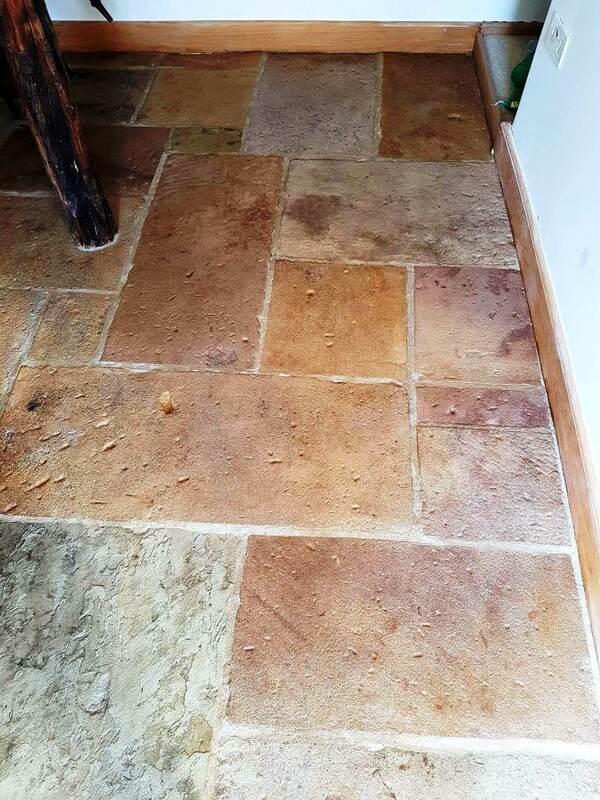 In this situation, I used Tile Doctor Colour Grow to seal the tiles as I knew it would enhance the natural shades in the Travertine. Colour Grow is a solvent based colour intensifying sealer that provides durable surface protection while allowing the surface to breath and enhance colour. 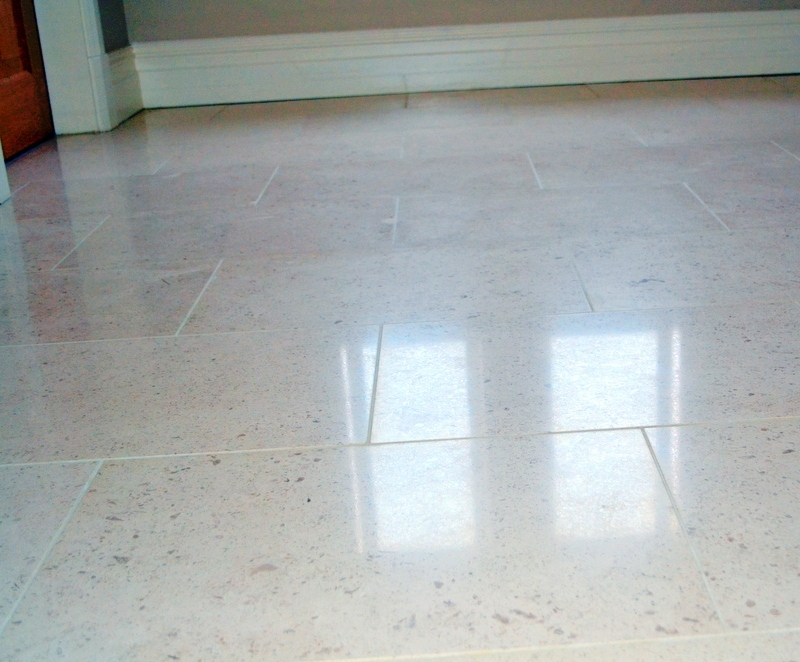 It’s really important that all excess sealer – that which doesn’t penetrate the stone – is polished off. For polishing off the excess, I used our three cloth system. After completing the sealing process, I went over the floor one final time with the Very Fine 3000 grit diamond burnishing pad to ensure a smooth and shiny finish. 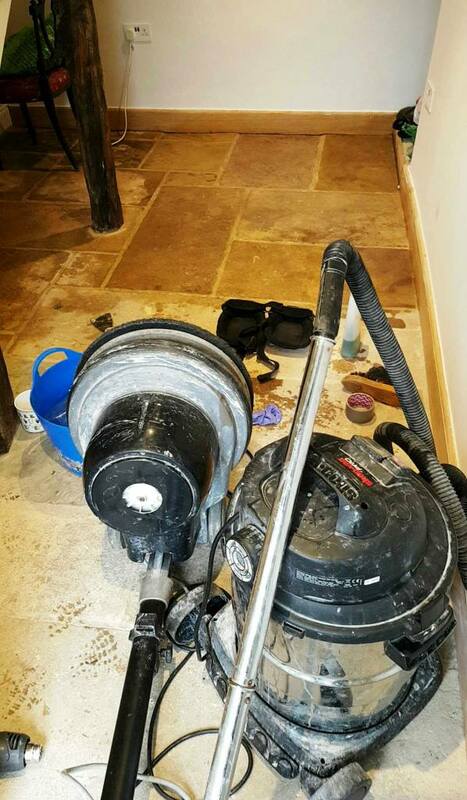 Needless to say, the customer was very happy with result, remarking that the floor never looked that good before! 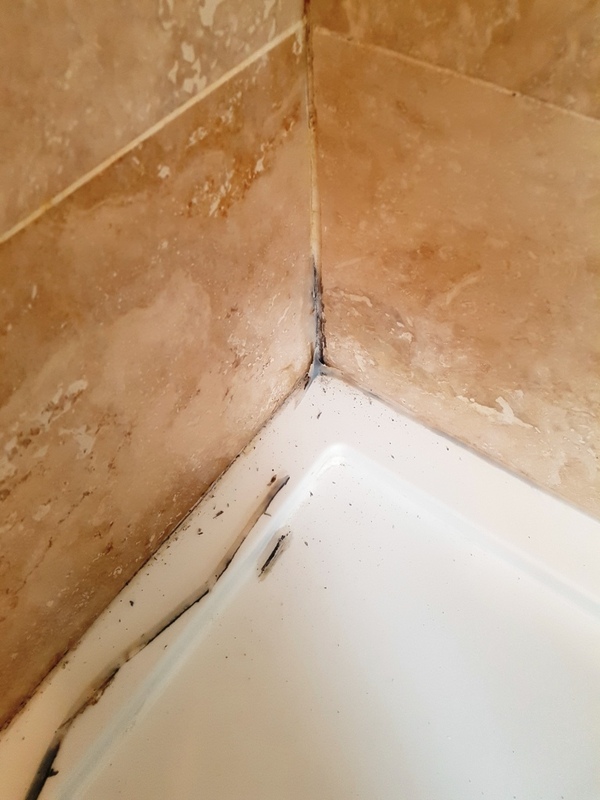 Shower and bathroom mould and soap scum growth are probably the most common, annoying and frustrating tile-related problems. Wet and high humidity areas with poor ventilation provide the perfect breeding ground for mould and stains. Soap residue and body oils also create a food source for soap scum, mould to grow. My customer in Dane Bank had the exact problem with dirty and mouldy grout lines in her shower cubicle. She had tried scrubbing the grout lines herself with a toothbrush and standard supermarket cleaners but never got the result she wanted. 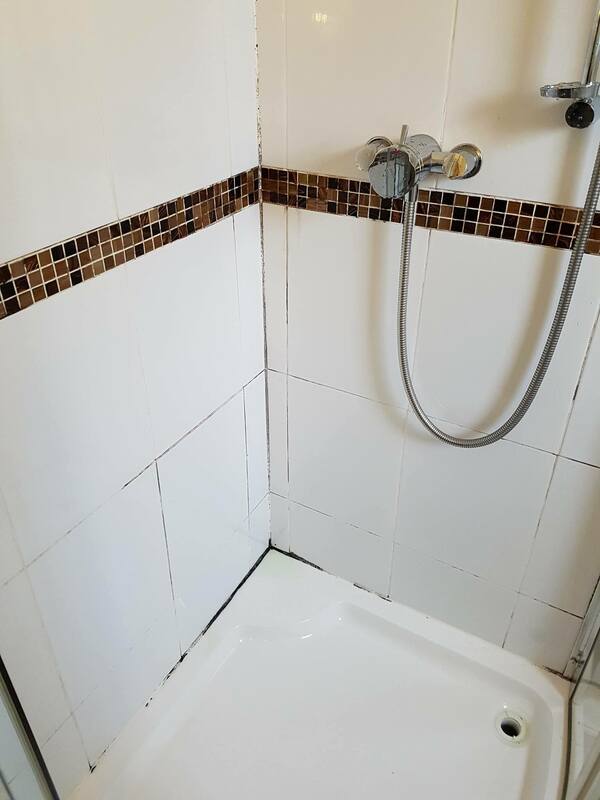 Fortunately she was lucky to find Tile Doctor from the internet and I was asked to pop over and take a look to see what could be done. I was confident we could make a big difference so I went through the options with her and give her price for the job. She was happy with the price and we agreed a date for me to return and complete the work. For grout lines cleaning I used Tile Doctor Grout Colorant Pre-Treat Cleaner, which successfully removes dirt, soil, soap scum and hard water deposits from grout joints. The product was sprayed on to the grout and left to dwell and seep into the pores for approximately five minutes to break down the soap scum and dirt before being scrubbed in using a stiff grout brush. The cleaning was successful but there were still few mouldy spots left. On these spots I used Tile Doctor Mould Away Spray that is meant for quick removal of mould from grout and silicone. One again product got sprayed on grout lines and left to dwell for five minutes and then scrubbed with stiff grout brush and then rinsed with clean water. After I had finished cleaning I express dried the tile and grout using high power heat gun. With the area nice and dry, I had to choose the matching colour for the existing grout. 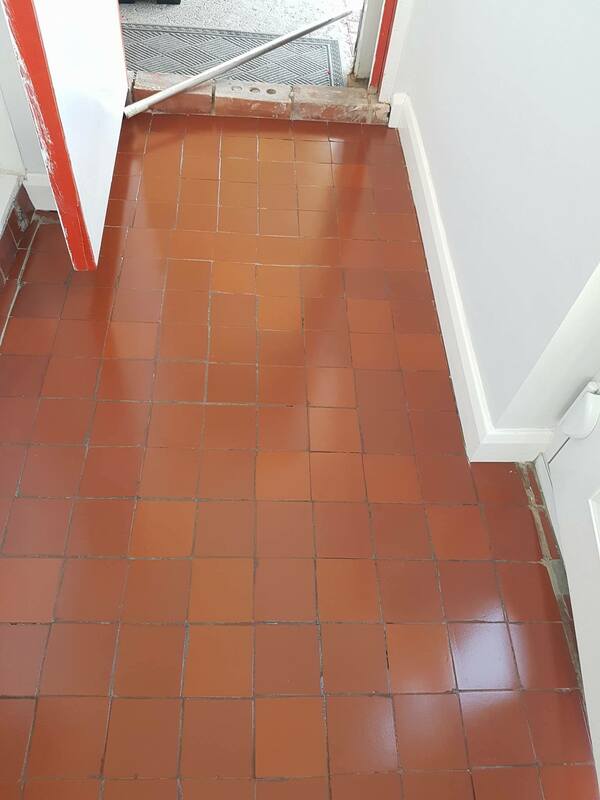 There are ten colours to choose from the Tile Doctor range of Grout Colourant and on this occasion we chose Limestone as the best colour to match the tile. The colourant is easily applied directly to the grout and in this case I applied two coats. 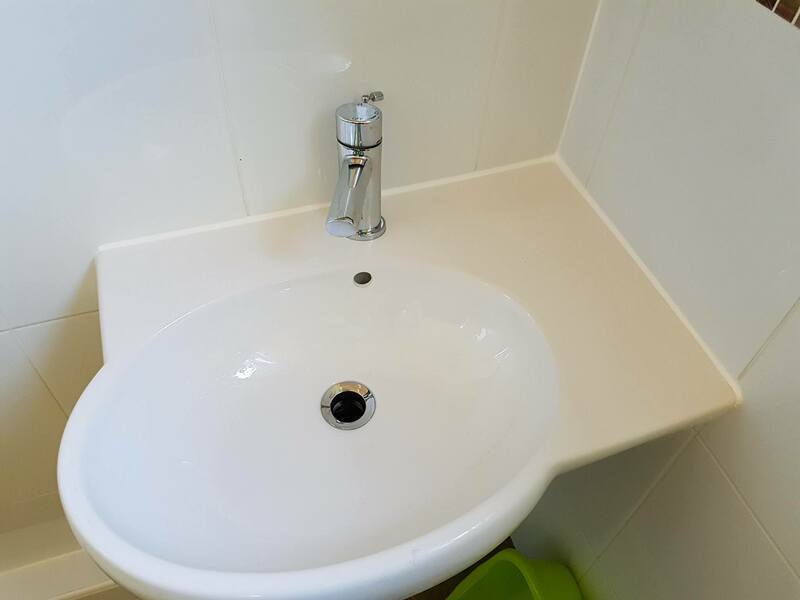 The product is epoxy based and completely seals and rejuvenates the appearance of the grout, which not only drastically improves appearance it also makes it much easier to clean in the future. After applying the re-colourant I buffed all grout colorant excess off the tiles and the shower cubicle was ready.